TYRA, Dolores - of Saginaw, age 88, loving mother and grandmother, went to be with her Lord and Savior on Wednesday, June 6, 2018 at Union Court Assisted Living in St. Charles. Mass of Christian Burial will be celebrated in memory of Dolores 11AM Tuesday, June 12, 2018 at Holy Spirit Catholic Church, 1035 N. River Road, Saginaw. Rev. Fr. Pete Gaspeny officiating. Burial to follow in Chapel Hill Cemetery. Family will receive visitors at the Reitz-Herzberg Funeral Home on Monday from 2PM until 8PM and at the church on Tuesday from 10AM until the time of Mass at 11AM. Memorial contributions may be made to the Alzheimer’s Foundation, American Heart Association, the Ovarian Cancer Foundation, or a charity of your choice. Dolores was born on March 5, 1930 in Saginaw, Michigan to the late Emil and Caroline (Bruns) Goschke. She attended St. John Lutheran and Saginaw High School. Dolores married Roman Tyra on March 6, 1950 in Angola, Tennessee. He preceded her in death on March 21, 2003. She worked for a few places throughout her life. Dolores started working for Michigan Bell in 1950. She then worked for the Yankee Store, T-Way, and Zody’s. Dolores finally retired in 1979. She was a member of Holy Spirit Catholic Church since 1950. 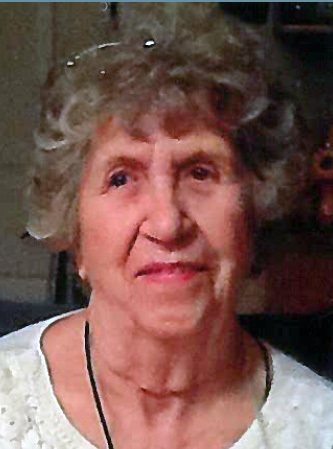 Dolores was a members of the Cultures Guild, Peacemakers, The Guild, and VFW Auxiliary Post #9809. She enjoyed fishing, knitting, crocheting, sewing, and spending time with her grandchildren. Surviving are: Daughters: Paulette Stuart and Lynette (Joe) Rozek; Grandchildren: Craig (Melissa) Stuart, Carrie (Peter) Molesa, Kevin (Monica Betker) Rozek, and Caroline (Jake Baker) Rozek; Sister, Beatrice Himmelein; Sisters-in-law: Betty Tyra and Mary Tyra; Brothers-in-law, Edward Tyra, Eugene Tyra, and several nieces and nephews. She was also preceded in death by: Brothers: Ralph Goschke, Russell Goschke, LaVerne Goschke, LeRoy Goschke, Leslie Goschke, and sister, Amelia. The family would like to extend a special thank you to the staff and residents of Union Court Assisted Living for their compassionate care of Dolores.